V-Band flanges are an excellent alternative to traditional flanged or split fit tube connections. Offering a low profile and modular connection, V-Band flange assemblies work especially well under operating conditions involving stress, vibration and extreme temperature fluctuations. The V-Band clamp design allows for a quick release, gasket free seal as well as superior positive retention versus other tube coupling methods. Vibrant V-Band flanges feature a unique "male/female" design to ensure proper alignment of the flanges inside the clamp. Flanges are available in both T304 stainless steel or T6061 billet aluminum construction. 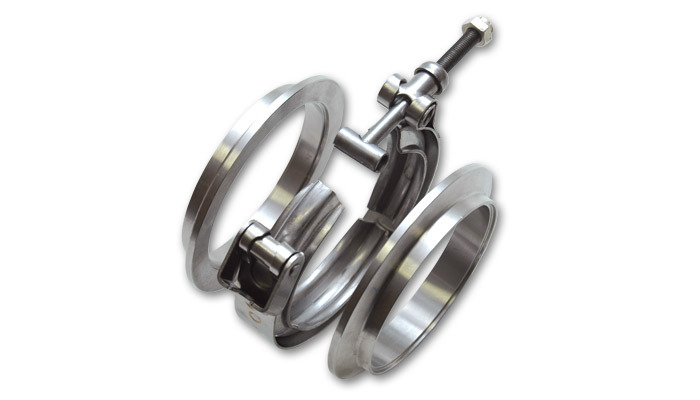 V-Band clamps are made from 300 series stainless steel.